Your donations will help us add more potential life-savers to the Be The Match registry this year. Even if you were unable to make a financial donation, we wanted to thank you for your continued support. Every dollar, like, share and mention brings us closer to our goal of saving more lives that are treatable with bone marrow transplants. The Icla Da Silva Foundation has been helping patients with blood cancers, and adding potential donors to the bone marrow registry, for 26 years. 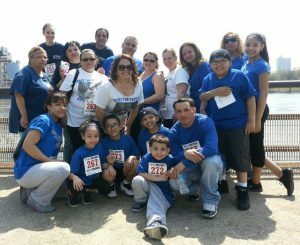 We started in memory of my sister Icla, who was unable to find the match that she needed to survive. 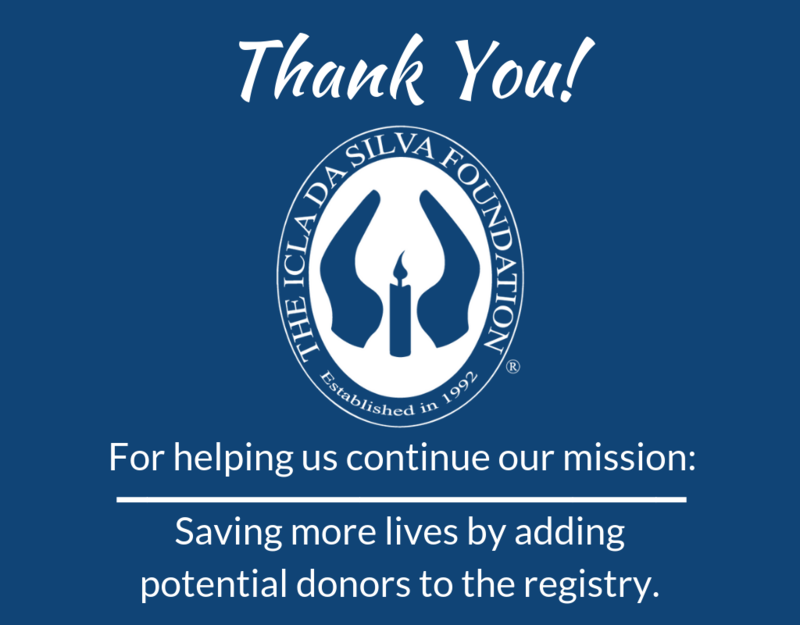 In her honor, every year the Icla Da Silva Foundation adds 38,000 new members to the registry. Potential life savers, with a strong focus on communities from diverse ethnic backgrounds. 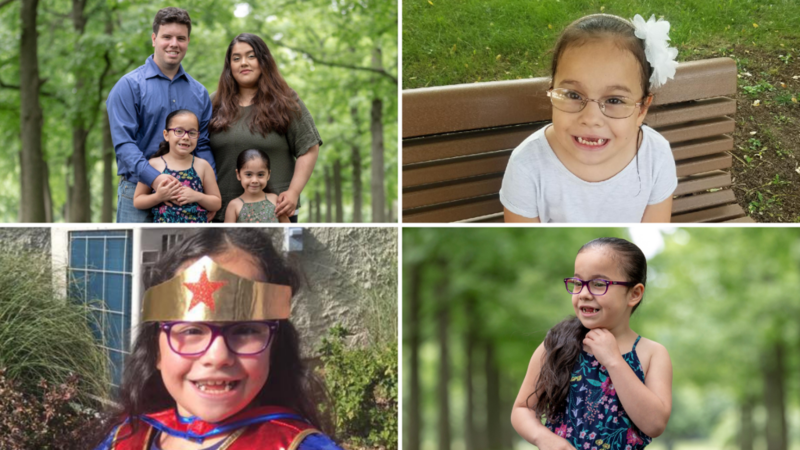 When a family learns that a loved one has been diagnosed with a rare disease or blood cancer, and is in need of a bone marrow transplant, the fear can be horribly daunting. Our goal is to offer these patients and their families hope for a second chance, hope for a life-saving stem cell or bone marrow match. One of our patients, Julian Morales, has been searching for his match since he was three years old. 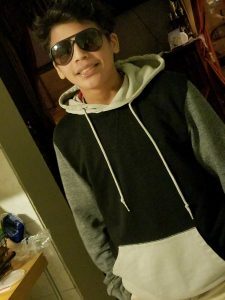 Now seven, Julian smiles when he speaks about the day he will finally be able to go to a water park with his family, or play outside with his sister, or simply enjoy a single nights rest without pain or discomfort. Julian was born with a rare genetic disorder, Dyskeratosis Congenita (DKC). His bone marrow does not produce enough blood cells, and his immune system is severely compromised. The team at Icla has been working to find a bone marrow match for Julian by hosting drives in diverse communities. Patients with Hispanic or Latino heritage only have a 46% percent chance of finding a matching donor on the registry. 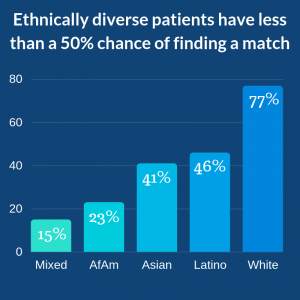 Those with mixed ethnicities have an even lower probability of finding their match. Julian is of Honduran and Guatemalan descent, and his need for a life saving match grows with every day. With the support of people like you, we continue the search for his match. 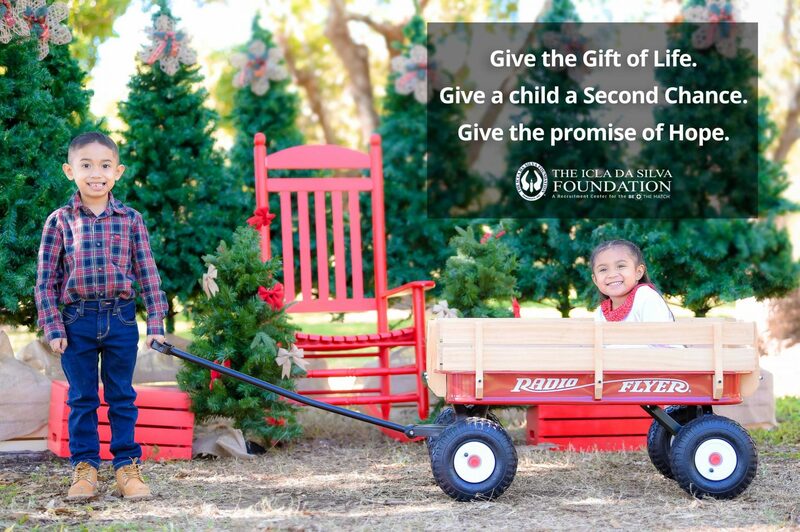 There are many deserving and inspiring Foundations to support on this #Giving Tuesday. This year we hope you think of the Icla da Silva Foundation, of Julian Morales, and of the thousands of children in need of their perfect match. Contributions like yours give hope to the patients, their families, and the many friends in their community. Throughout the month of July, the Icla da Silva Foundation is running the Summertime Swab Challenge. Enter a guess – how many swabs did we fit in the jar? The person with the closest guess to the actual number of swabs will get to choose one of two fantastic prizes, valued at over $500. While you enjoy the warmer days and bigger smiles associated with summer, we hope you will take a chance and enter a guess to help a patient in need. Swabs are a big part of what we do. When you join the Be The Match bone marrow registry, you receive a swab kit in the mail. After you have swabbed the inside of your cheek, you send it back to Be The Match so that your HLA type can be tested, registered, and included in patient searches. Hopefully you will be matched to one of the 14,000 patients who need a transplant to survive. Swabs are about registering yourself to become a life saver. During the month of July, we are using swabs to increase awareness and raise funds so that we can continue to save more lives. We have filled a 2.5 gallon glass jar with q-tip sized swabs and closed the lid. Underneath the jar is an envelope that details the # of swabs included in the jar. On August 1, 2018, we will open the envelope on social media and reveal the # of swabs. Will you be a winner? 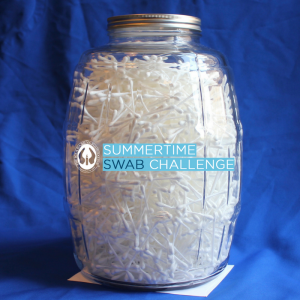 From July 1st through July 31st, you will have the chance to make a small donation* and enter your guess as to how many swabs we have fit into the jar. All donations will go towards our Patient Support Services program. Based on need, we try to assist patient families with expenses associated with bone marrow testing and treatments. Items like HLA typing, medical co-pays, transportation, and housing can become overbearing when a patent, or their family, don’t have the savings available to manage all of the costs associated with an extensive treatment plan. Donate and guess as often as you like. Share your guess with your social network. Every donation will help a patient in need, sharing on facebook will help increase awareness about how easy it is to become a life saver, and entering will earn you a chance to win a fantastic prize. * no donation necessary, see official rules for alternative entry. Option A: If your guess is the closest, you could choose (2) tickets to the 2018 Annual Hope Gala event in New York City. The Gala is our black tie (optional) dinner and dance where we celebrate our recent achievements and showcase a first time meeting between a transplant patient and their bone marrow donor. You will enjoy great company, good food and dance the night away. You will laugh, you will cry, and you will help us celebrate the patients who we support and the lives that we save. 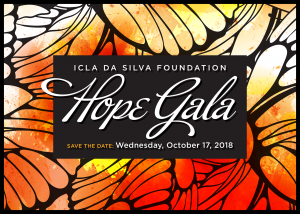 The Hope Gala event takes place on October 17, 2018 at Gustavino’s, 409 East 59th Street, New York, NY from 6:30PM until 9:30PM. Transportation, accommodations and other costs associated with attending this event are not included with this prize award. Total retail value is $900. Option B: As an alternative, you may choose a $500 gift certificate to the Brazilian steakhouse, Fogo de Chao. The restaurant is inspired by the grand kitchen tables on the farms in Southern Brazil, where family and friends gather to share the finest and the freshest from their harvest. Fogo de Chao has 39 locations throughout the U.S. and Puerto Rico and the gift certificate is available to use at a location of your choice until August 1, 2020. On August 1, 2018, on social media, we will open the envelope that reveals the # of swabs in the jar. Will you be the winner? Enter a guess and you may have your choice between one of 2 great prizes. Please share our sweepstakes promotion on facebook and ask your friends to enter their guess. “Little” Ricky Roman isn’t so little anymore, he is now almost as tall as his dad, “Big” Ricky. In February, Little Ricky turned 16, but the blood pulsing through his body is technically only seven years old. 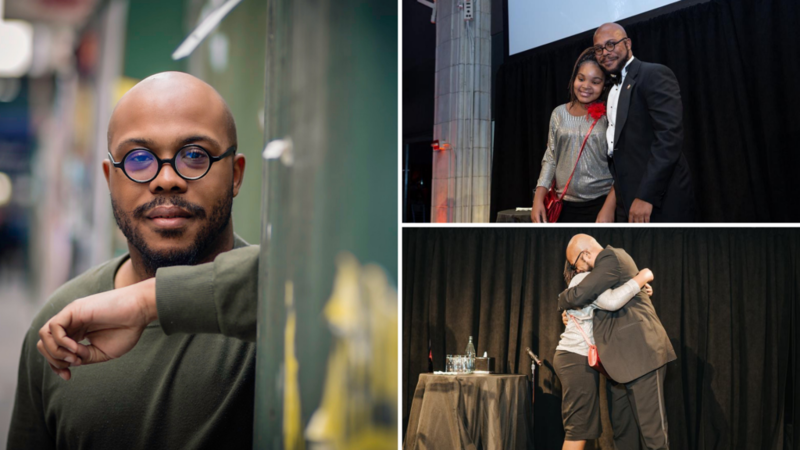 In May, he celebrated his 7th transplant birthday, 7 years after receiving a stem cell transplant from an unknown donor. In September 2010, Little Ricky wasn’t feeling well. He was bruising easily and his eyes were a pale yellow. His parents rushed him to the doctor. One month later, he was diagnosed with severe aplastic anemia, a rare and serious condition in which the bone marrow stops producing enough new blood cells. It leaves you feeling weak and fatigued, with a higher risk of infections and potential heart complications. Little Ricky was an active child, so his fatigue was an obvious sign that something was wrong. He liked biking, baseball and boxing. After diagnosis, his obsession with boxing took on a new meaning. 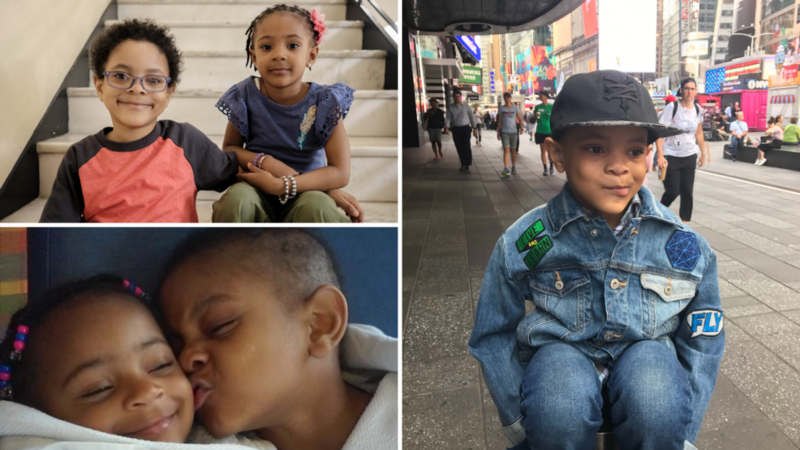 While no one is prepared for a battle with cancer, Little Ricky became a true fighter. It was determined by his doctors that a stem cell transplant was his only cure. At the time, there was no match on the Be The Match bone marrow registry. Aunts, uncles and cousins were tested. Unfortunately, no one was a match for Little Ricky. With the support of his family, friends and the Icla da Silva Foundation, everyone was determined to find a match. We held bone marrow drives, getting as many people as possible to join the registry, and we all hoped that a life saving match would turn up. Ricky spent a year going back and forth to the hospital, for treatments, tests and observation. His mom had to quit her job so that she was always available for a quick trip to the hospital, an overnight stay, or weeks of treatments. Little Ricky Roman, the fighter, received a successful transplant in May of 2011 at NY Presbyterian Hospital. Someone who had joined the Be The Match registry was a match for Ricky. Fortunately, they said yes to a stem cell donation. Ricky has yet to meet the donor who joined the registry. He knows that it is a woman, and he is grateful that she said yes when she received the call asking her to donate. We hope to be able to arrange a meeting between Little Ricky and his donor. Since the time of his diagnosis, the Roman family has been very supportive of the Icla da Silva Foundation. 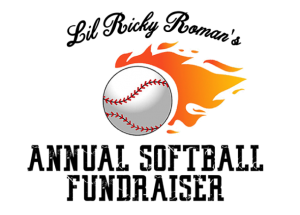 They are avid sports fans; they ran together in our annual 5K, and for the past 8 years, the Roman’s have been hosting a Softball Fundraiser to support the Icla da Silva Foundation. We are extremely grateful for their efforts. The money they raise helps us continue fighting for patients who need a bone marrow transplant. 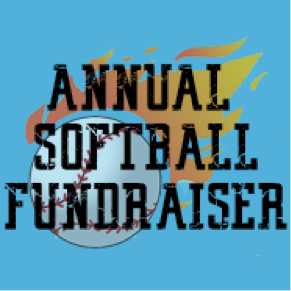 You can click this link to find out more information about the Ricky Roman Softball Fundraiser and register a team. It’s easy to enter a team, or simply support their efforts through a donation. We are very grateful and we appreciate their continued support of our efforts. We know many patients are thankful as well (click below to support the fundraiser). According to his Aunt Maria, Ricky is doing well. He starts High School in the fall. He loves baseball, bikes, and playing video games. Of course all children love playing video games, often to the exasperation of many adults, but this is a special circumstance. Spending a year in and out of the hospital for treatments gives ‘playing video games’ a new understanding. Keep fighting Ricky, keep playing, keep growing, and thank you to you and your family for continuing to raise funds for us. 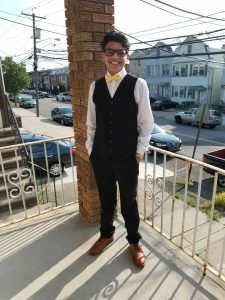 In early July of 2017, Aashim Joy was diagnosed with ALL (B-Cell Type Acute Lymphoblastic Leukemia). His only hope for a cure is a matching bone marrow transplant, and we first reported his story here. Aashim is currently in remission, which is good news, at least temporarily. For leukemia patients undergoing chemotherapy, remission means that there is ‘less’ cancer in the body. Unfortunately, the chance of a relapse, or a recurrence of cancer, remains high and it is important that they maintain their treatments, and continue their search for a matching bone marrow donor. Aashim Joy lives up to his name, literally. He is in good spirits, always positive and usually ‘joyful’. He is very focused on spreading the word about joining the registry and supporting patient services. Recently, he attended and spoke at our 5K in NYC, he also talked about his journey at our Mix & Match event last month. If you attended either event, you heard Aashim speak about becoming a superhero. He is on a mission, he wants to create superheroes. He is devoted to educating as many people as possible about the importance of registering to become a bone marrow donor, and staying committed if you are identified as a match for someone. He wants everyone to understand how meaningful it is to save a life and thus, how easy it is to become a superhero. Aashim, along with his beautiful and intelligent wife Reema, stand behind this mission, to raise awareness and increase support. From their apartment in NYC, Aashim and his wife have spearheaded many bone marrow drives throughout India. 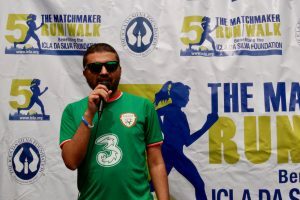 His friends at Deloitte put together a fundraising team and participated as ‘Run For Joy’ in the MatchMaker 5K. 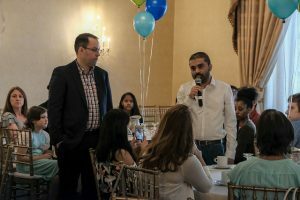 Aashim even donated his birthday to the Icla da Silva Foundation, helping our efforts to provide more patient support services to those in need. 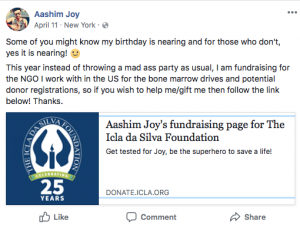 Aashim donated his birthday by setting up a simple donation page. He went to www.icla.org/get-involved and clicked on “Fundraise with Us.” From this link, he easily developed an online fundraising page. Aashim wrote a short paragraph about his experience, and then posted the link to his Facebook page, inviting his friends and followers to get involved. The fundraiser lasted until his birthday, and raised 120% of the goal! 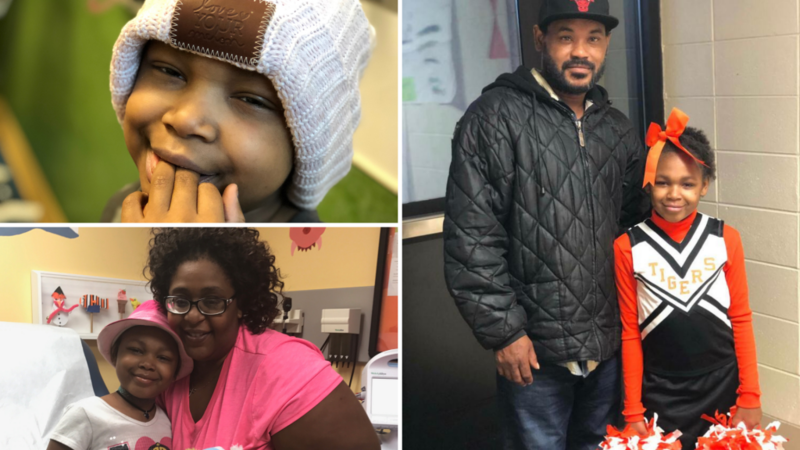 Thank you to Aashim and all his friends and family for taking this extra step to ensure that more patients who need a bone marrow transplant can find a match. You are all superheroes and you are all saving lives! It’s so easy to start a fundraiser for the Icla da Silva Foundation. Follow the same steps as Aashim, customize your fundraising page, and share with your friends and family. It doesn’t have to be your birthday to get involved. Whether you’re running a marathon, remembering a loved one, or celebrating an anniversary, any time is a good time to be a superhero and help save lives. Everyone between the ages of 18-44 can be a superhero. Start by joining the registry in honor of Aashim https://join.bethematch.org/gettestedforjoy. If you want to make a donation to Aashim’s birthday fundraiser, you can still do so here. Thank you to Aashim, and his wife Reema, for your continued efforts to spread awareness about blood cancers and the power of joining the Be The Match registry; saving a life can make anyone a superhero.